Walt Disney is an American icon. He was born December 5th, 1901 in Chicago. He spent his early childhood in Marceline, Missouri. Even as a child, Disney was interested in the arts and in making money. When his family moved to Kansas City, Walt started running a paper route for his father. He said of his working life, “’I don’t regret having worked like I’ve worked…I can’t even remember that it ever bothered me. I mean, I have no recollection of ever being unhappy in my life. I look back and I worked from way back there and I was happy all the time. I was excited. I was doing things’”(Barrier, 23). On top of the paper route, Disney also put on plays at school and put together skits for amateur nights at theaters nearby. In Michael Barrier’s biography of Walt Disney, he writes “Disney had clearly inherited his father’s entrepreneurial temperament, but he had entered business for himself for the first time, he enjoyed a great advantage: he was free of his father’s rigid, debilitating beliefs”(25). Disney’s father encouraged him to work from early on, which certainly contributed to his work ethic and his success with Disney Studios. He built his company from the bottom up and with limited resources. While he was successful overall, there was no shortage of hard times. Barrier writes of Disney, “whenever he spoke of his hardships and how he overcame them, his voice was usually that of a rigorously optimistic entrepreneur”(38). Disney had an ambitious vision that he wouldn’t give up on regardless of the difficulties he faced. Disney not only changed the way animated films were made, but he also changed the way Americans viewed animated films. He began as an animator, but as his company grew, he moved away from animation and toward coordinating and overseeing the projects in progress at Disney Studios. The people who worked with him admired him and recognized his entrepreneurial ability as Barrier writes, “his powerful entrepreneurial drive combined with his new artist’s sensibility, that made Disney so inspiring a figure to many of the people who worked with him in the mid 1930s”(99). While many employees admired him, Disney also intimidated them. He was so passionate about animation that he expected all of his employees to be the same way. He became so immersed in the production of the films that he even spoke of the characters as if they were real people. He was particularly invested in the production of Snow White, for example, one of his employees said of him, “’he used to come on like a madman, hair hanging down, perspiring…Christ, he was involved’”(Barrier, 125). Disney’s dedication made it difficult for him to delegate work to his employees. There was little distinction between Disney the man and Disney the studio. Snow White premiered in 1937 and was the first full-length animated musical feature. The film was a huge success and helped Disney from falling deeper into debt. After Snow White, Disney Studios produced a number of other feature-length films including Dumbo, Fantasia, Pinocchio, and Bambi. In total, Disney Studios produced over 100 feature films. Disney may be best known for his films, but he was an innovator and a pioneer in a number of other markets. He started doing television in 1954 with shows like The Mickey Mouse Club and Wonderful World of Color. Disney’s dream of a utopian world was manifested in Disneyland, which opened in 1955. 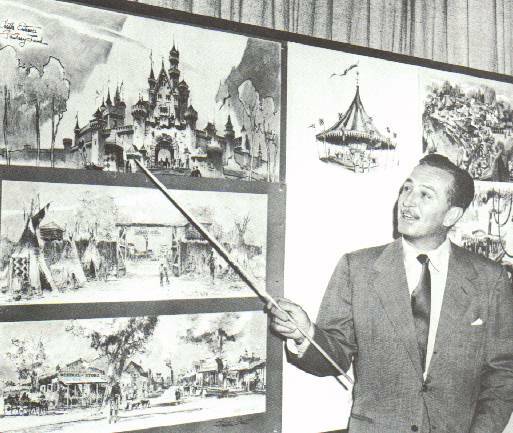 Disney was successful because his visions were strong and unique and because he was highly motivated and willing to take risks. As I vicariously lived Walt’s life, I was surprised by his obsessiveness, which is so at odds with the media image of genial ‘Uncle Walt.’ Disney was, from virtually the time he was a teenager, a man possessed by a vision, a man who believed that he could ameliorate the hurts he felt he had suffered by constructing a more perfect world and then inhabiting it. I was surprised, too, by the price he paid for his obsessiveness: the loneliness, the mental anguish, and the disappointments. He was anything but the happy, simple man we think of when we think of Walt Disney (Ayers, 1). Walt Disney was one of the most influential Americans of the 20th century, especially for the ways in which his films, animation, comic strips, documentaries, songs, business and theme parks impacted American culture. In his works, Walt Disney used political impulses, especially in his adherence to the American past and small-town traditional values, to reflect on the major events of the 20th century. His work engaged concepts we have studied so far in Viewing America such as the military-industrial complex, The Cold War, HUAC, anti-communism, labor unions, gender roles, consumerism and the American nuclear family. There were many incidents during Disney’s life that helped to form his political conservatism. One example is that during World War II, there was a strike at the Disney studio, which infuriated Walt. After this incident he became strongly opposed to unions. Later during the war, the studio became a supply base for American troops. While Walt supported the war, he was known for being very frustrated with the government during this time. For example, the company did not get paid for some of their Wartime productions. Disney eventually became weary of big government. After World War II, Walt famously testified before HUAC during an investigation of communism in the entertainment industry. Disney claimed that everyone in his office was “American”. He reaffirmed his distain for labor unions and commented on how those who had been a part of the strike in his office were a communist group who were trying to influence his artists. Thus to Disney, to be communist was to be un-American. Although Disney claimed to be politically neutral in interviews, there are many political undertones in Disney productions. What were some political themes in the works of Walt Disney? Disney characters upheld “traditional” gender roles and ideologies. His view of the family was also traditional and sentimental. Disney grew up on a farm in rural Missouri, and he used themes of virtuous American folk and stressed individualism in his productions. He believed in cultural imperialism, especially that the values of the US middle class could lead to prosperous societies around the world. Ayers, Jeff. “Neal Gabler.” Literary Journal, October 15, 2006. November 5, 2011. http://www.libraryjournal.com/article/CA6379522.html. Barrier, Michael. Animated Man: A Life of Walt Disney, Berkeley: University of California Press, 2007. Watts, Steven. “Art and Politics in the American Century.” The Journal of American History. 82. no. 1 (1995): 84-110. http://www.jstor.org/stable/2081916 . (accessed November 10, 2011). Jackson, Kathy Merlock, Walt Disney: A Bio-Bibliography. Greenwood Press, CT, 1993.